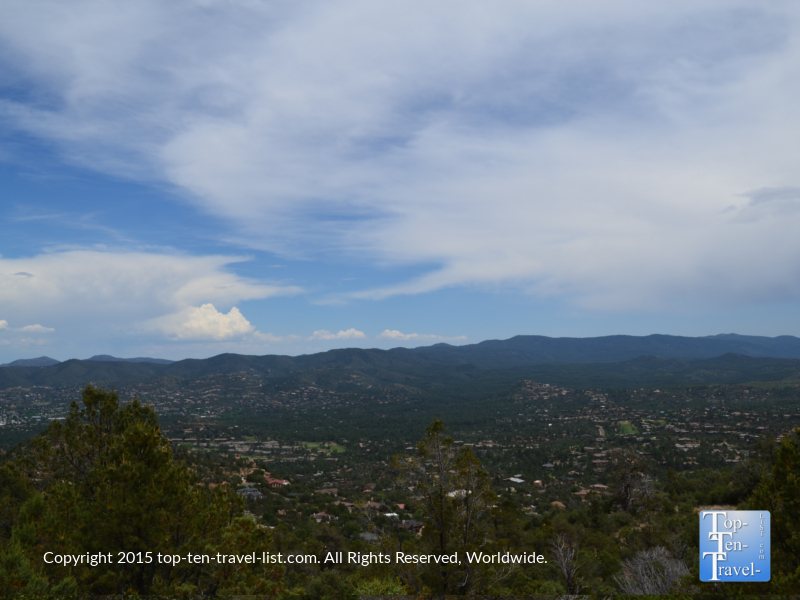 Hiking in Gorgeous Prescott, Arizona: Thumb Butte Trail #33 - Top Ten Travel Blog | Our experiences traveling throughout the US. 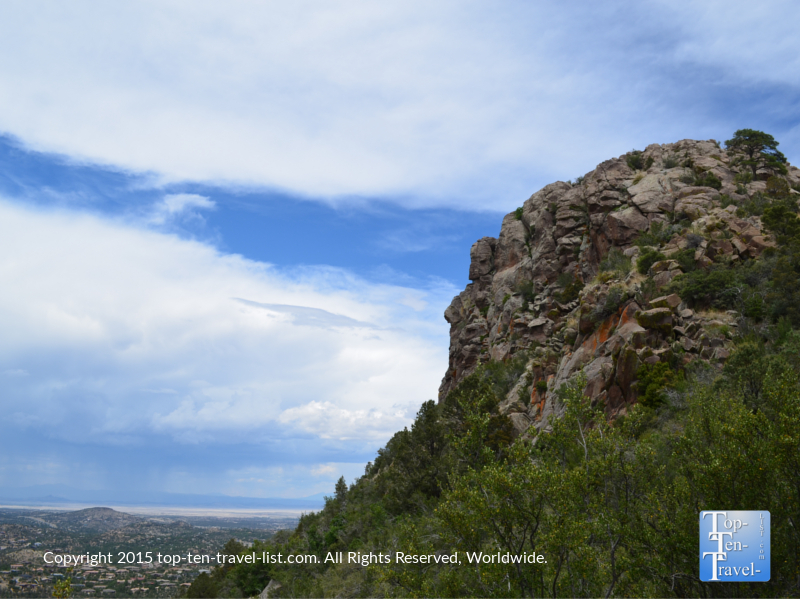 Prescott is a gorgeous Northern Arizona city known for its’ wonderful recreational activities. Biking and hiking trails can be found throughout the city. 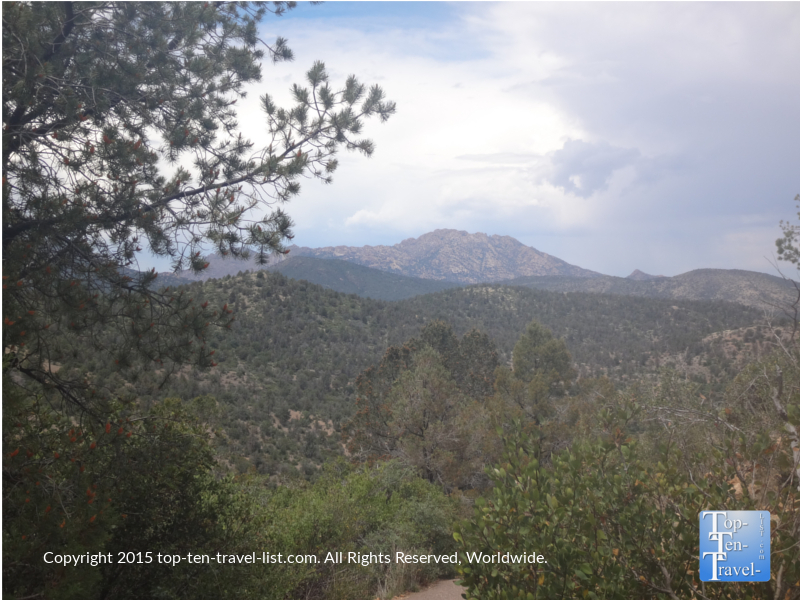 The million plus acre Prescott National Forest, which offers over 450 miles of trails for hikers, bikers, and horseback riders, offers endless opportunities for year round recreation. 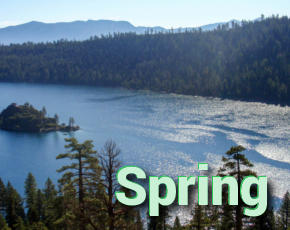 Prescott’s wonderful 4 season climate, which includes hot summers (although not nearly as hot as Phoenix) and mild winters (daytime highs average in the 50’s), means that you can have fun outdoors almost any time of the year. Due to the dry climate and high elevation (5400 ft), summer mornings and evenings are considerably cooler, therefore making this the perfect time to get out there on the trails. 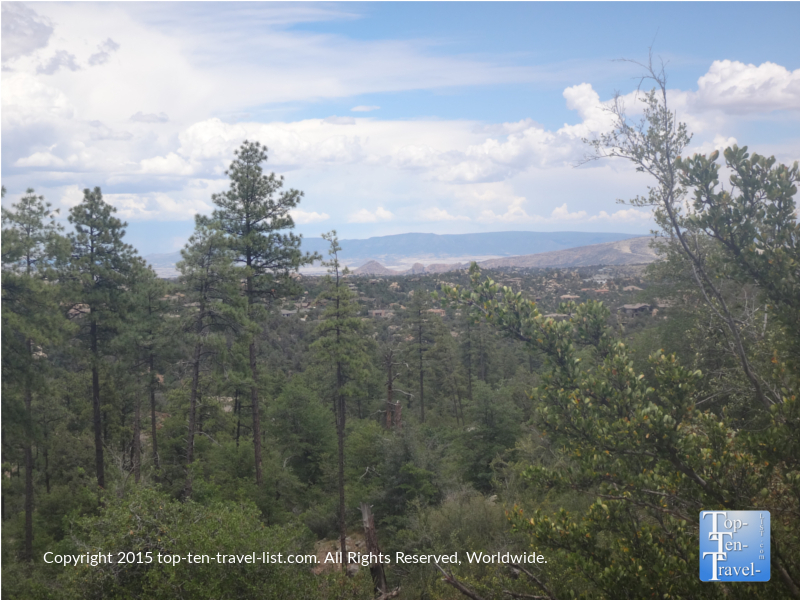 Prescott offers an ideal combination of fantastic mild 4 season weather, beautiful mountain scenery, and an abundance of recreational activities. 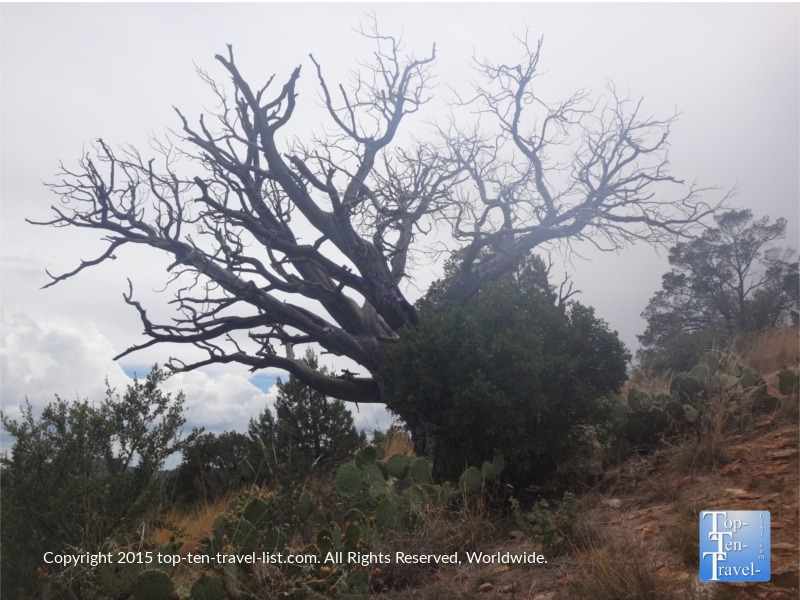 It also has the advantage of getting much less tourists than other Northern Arizona hotspots like Sedona, Flagstaff, and the Grand Canyon. 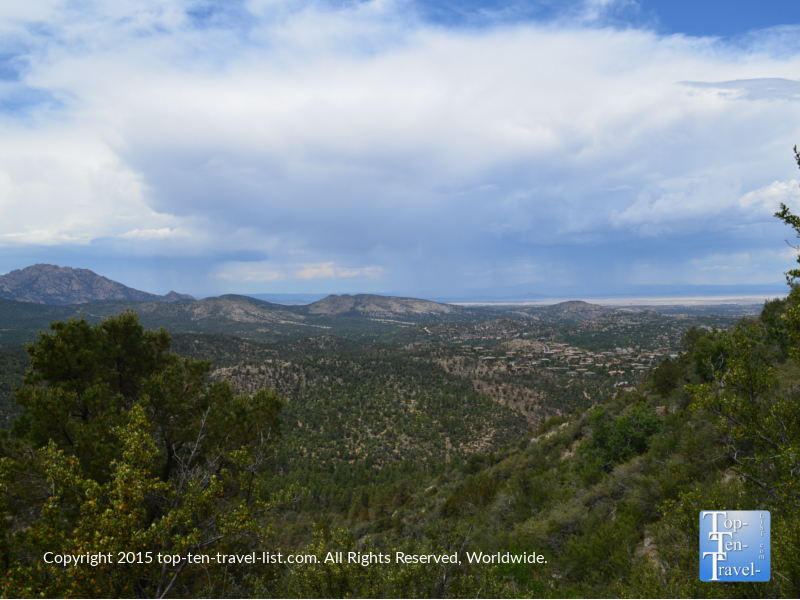 When planning a trip to Prescott, you can expect peace and quiet and gorgeous high desert scenery. 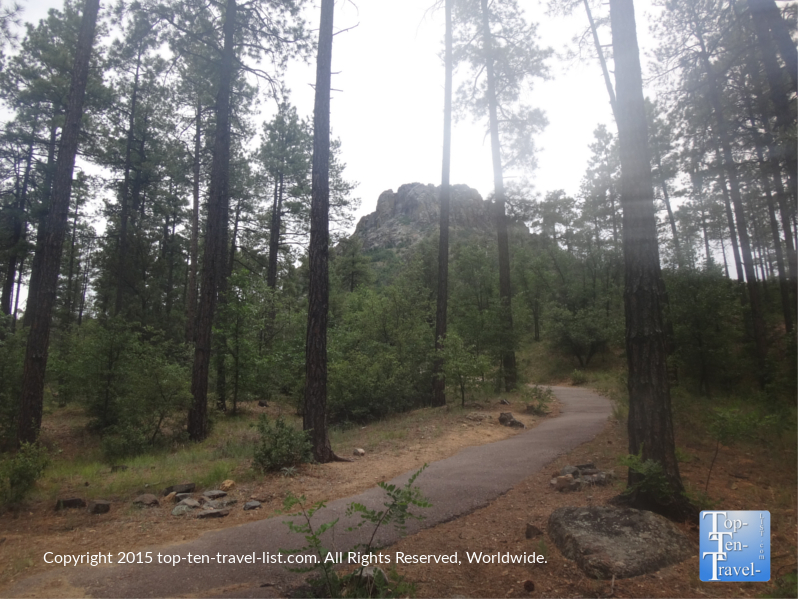 One of the best trails to check out during your visit is the Thumb Butte Trail #33, a gorgeous, moderately challenging option just 10 minutes from downtown, in the Prescott National Forest. 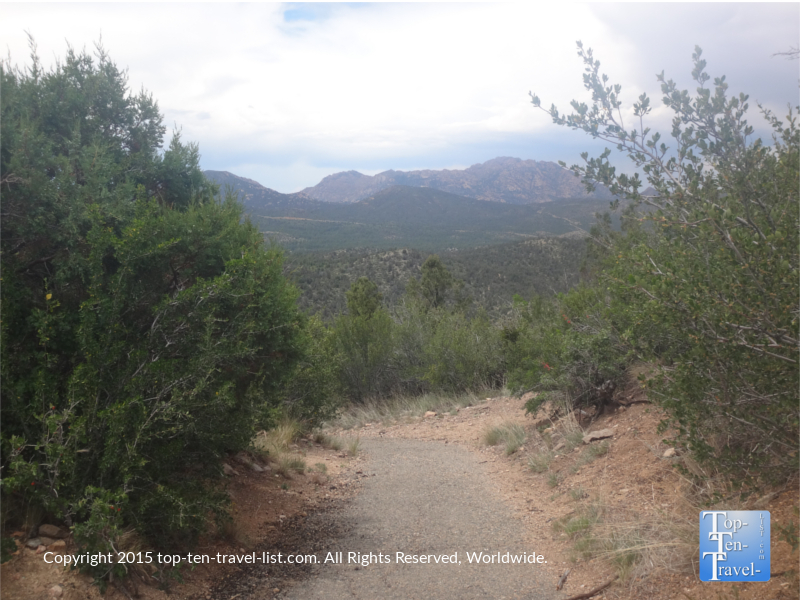 This gorgeous trail lets you take a glimpse at both wooded and desert scenery. 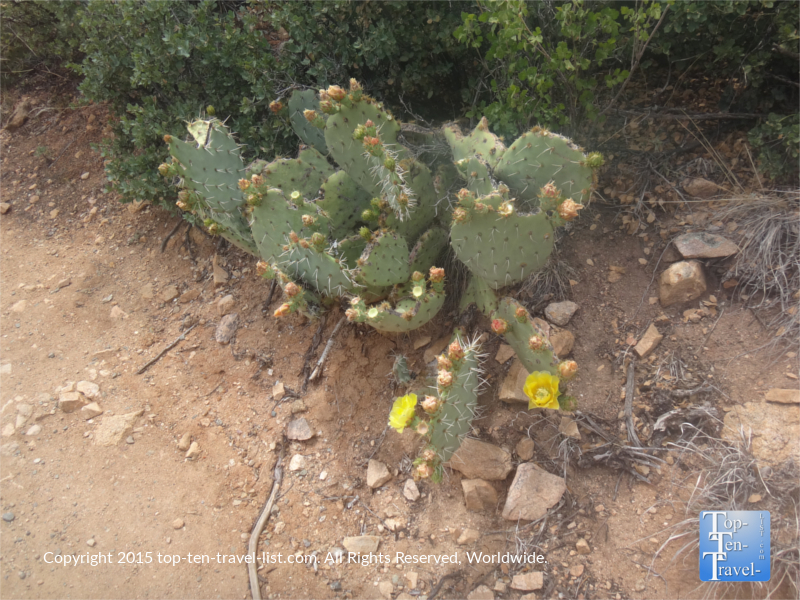 Along the way, you can expect an interesting mix of plant life including cactus, ponderosa pine, scrub oak, manzanita, and yucca. 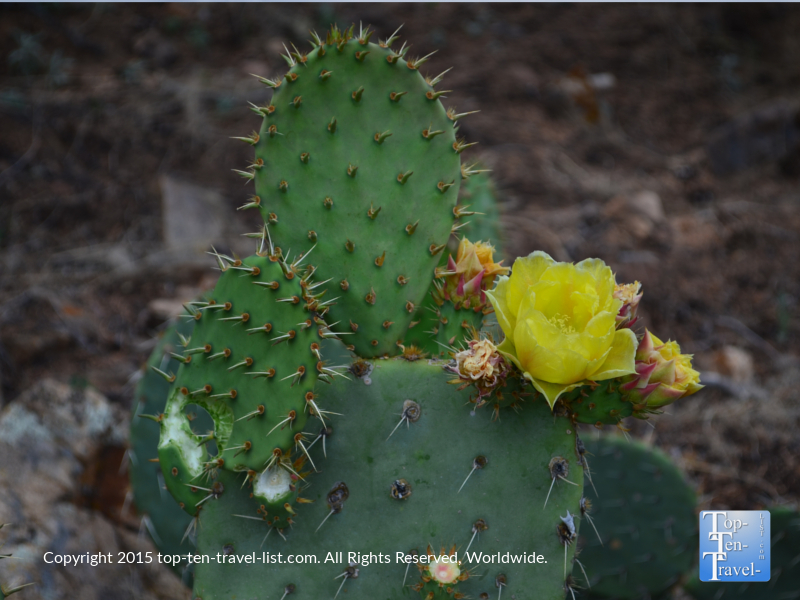 Due to the elevation, you get the advantage of exploring both beautiful desert and forest scenery. The Thumb Butte loop is approximately 2 miles. 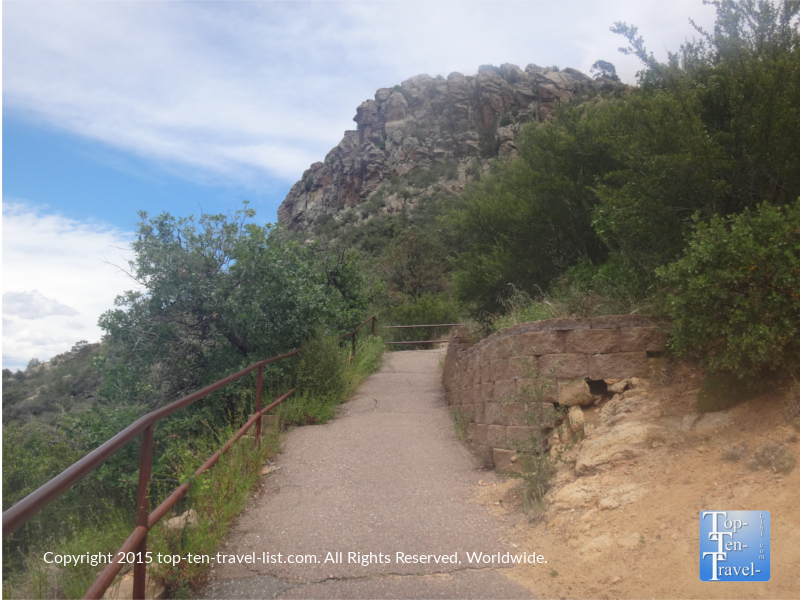 The first 0.7 miles or so takes you up on a steep, although paved path, which you will continue to travel until you arrive just below the top of Thumb Butte, a volcanic plug. 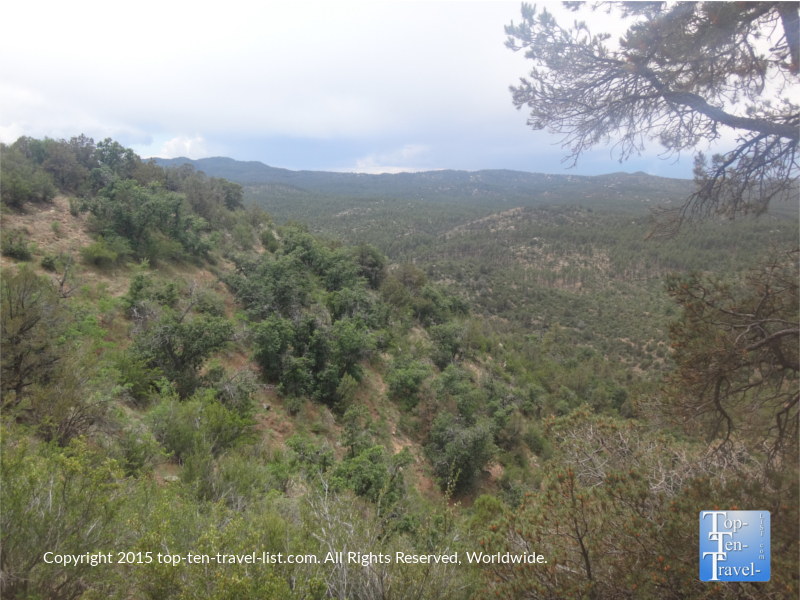 You will gain about 1200 feet in elevation, going from approximately 5000 to 6500 feet. Going up hill continuously for over a half mile is quite challenging, however, as you can expect, the views are exhilarating. The hefty climb is well worth it for the panoramic views of the city and surrounding mountains. 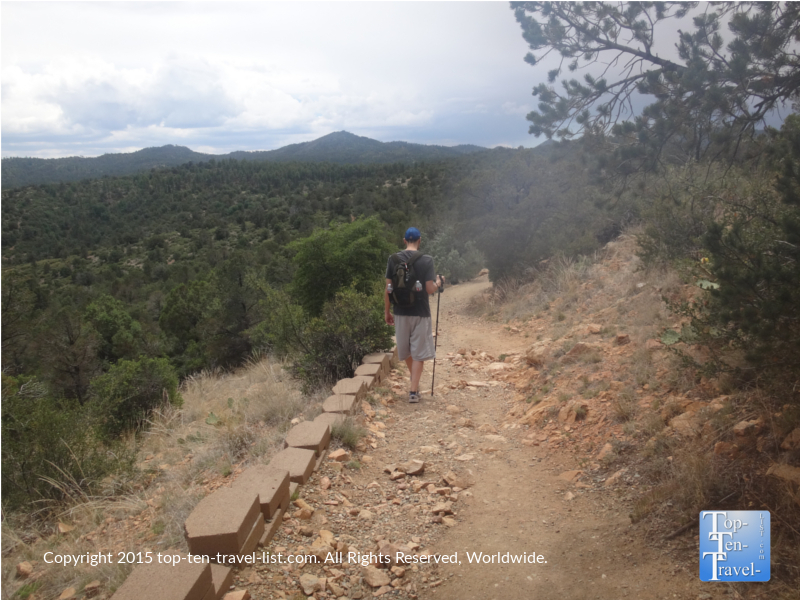 After reaching the summit, you will take a more relaxing trek downhill on a gravel road. This will allow you to recuperate after your heart pumping hill workout. Take your time as it can get a bit slippery (this is where having a hiking stick and/or good hiking shoes is beneficial). The scenery is more wooded this way and quite peaceful. Even on a weekend morning, the trail does not see half as many crowds as more popular destinations in Northern Arizona. The less touristy feeling gives you a natural out in the wilderness type feeling. There is absolutely no traffic noise, and therefore, the journey becomes a peaceful trek into nature. 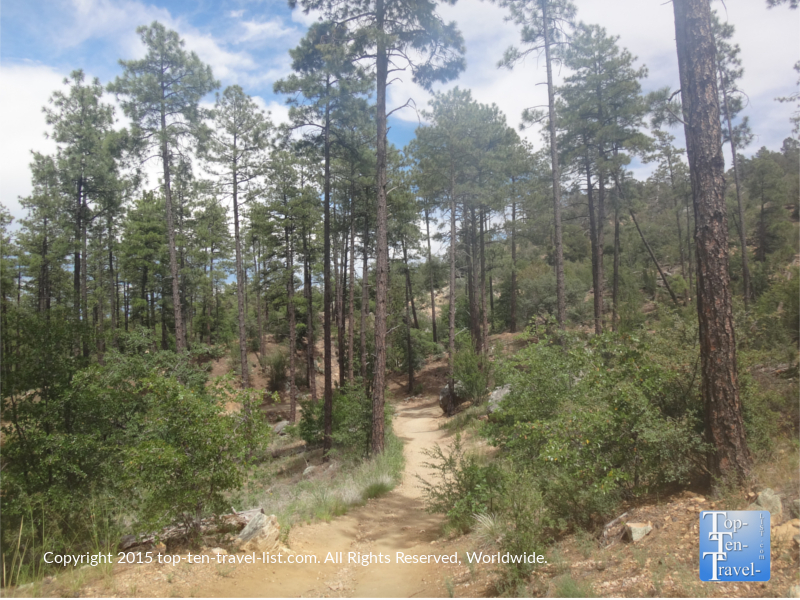 There are many fantastic trails to explore in the beautiful Prescott National forest. Thumb Butte should be the first stop for any new visitors. 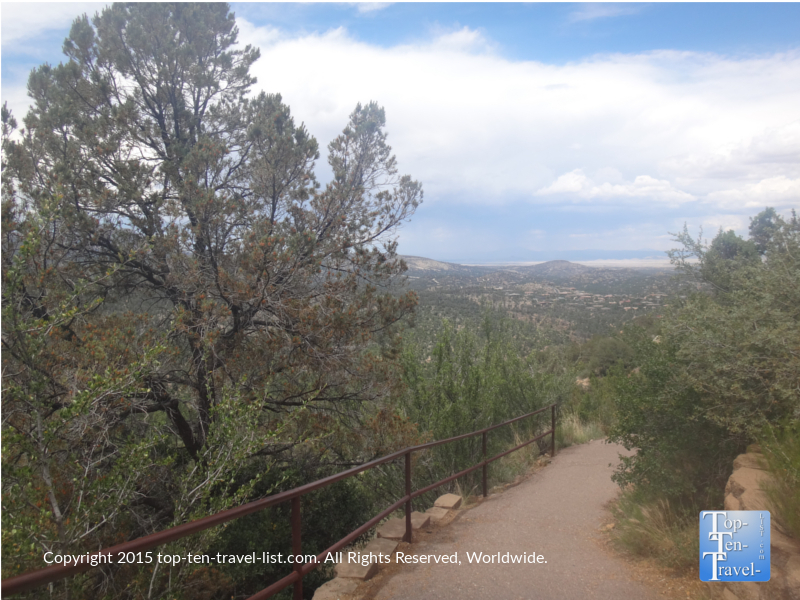 On this short trail, you’ll experience both breathtaking views and an awesome workout. The trail is easy to follow and offers one of the most spectacular views in town – you really can’t go wrong picking this hike. 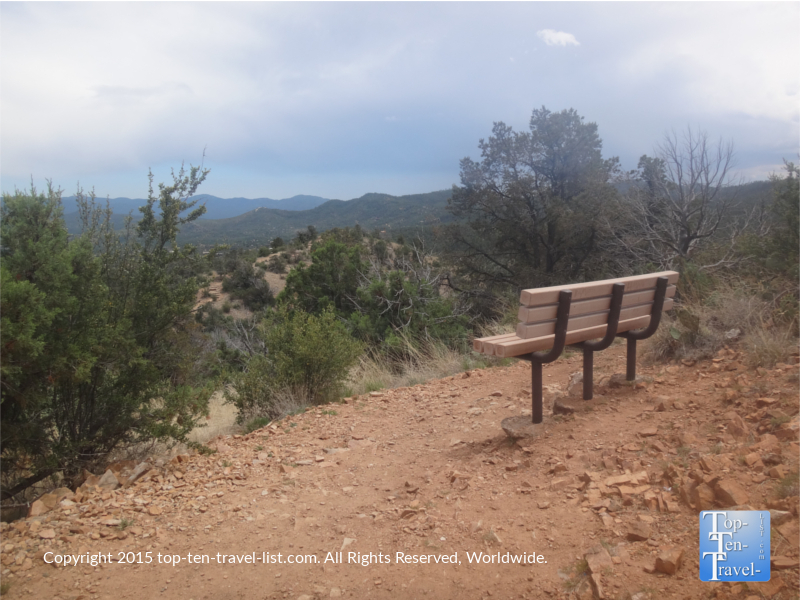 Although the climb up is a bit tough, beginning hikers should still have no problem as there are many places to rest, including several benches and scenic overlooks along the way. Just take your time and stop every so often to check out the views. Believe me, you will want to get out your camera! *Wear plenty of sunblock. There isn’t much shade, and at higher altitudes, you are more likely to burn. *Bring with plenty of water. A camelbak works great in the dry, desert climate. *Wear a GPS watch so you can track your mileage. Going uphill is much easier when you know the ending point! *Wear sunglasses. Again, there isn’t much shade. *Bring your camera! The views are fantastic from every point. *Wear proper hiking shoes. The return portion of the trail can be a bit slippery at points. *Bring a hiking stick. 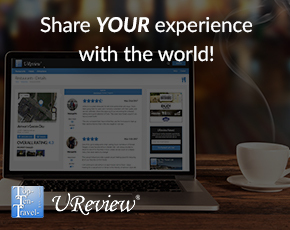 It is very helpful in helping you gain traction. It also serves as protection against mountain lions. *Watch out for wildlife. Both mountain lions and various snakes can be spotted at any time. *Plan your hike early in the morning during the hot summer season. The desert temps vary drastically throughout the day. Your hike will be much comfortable, not too mention less crowded, during this time. *Always pack a backpack with essential hiking supplies such as light snacks, water, a fully charged cell phone, first aid kit, etc. Parking is located at: 2600 Thumb Butte Rd. in Prescott AZ. There is a $5 fee. Be on the lookout for free days throughout the year. 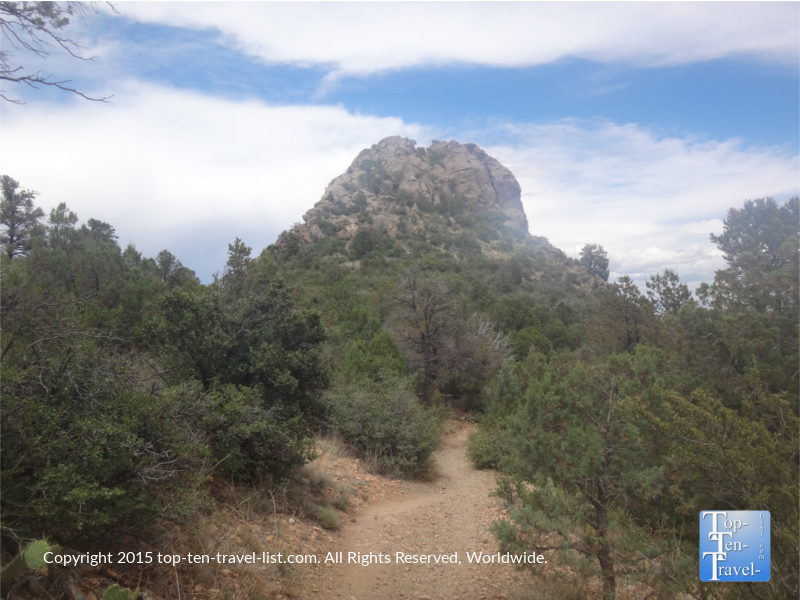 Have you ever hiked Thumb Butte? 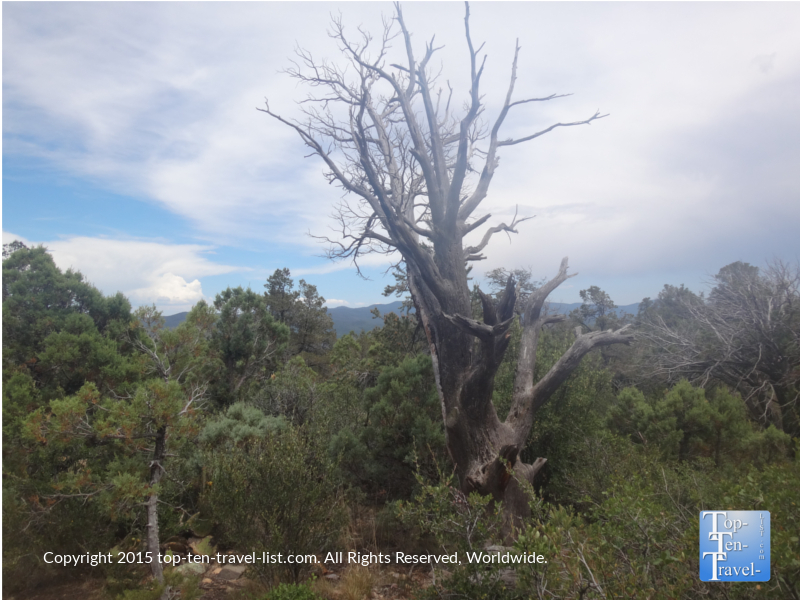 What other hikes would you recommend in the Prescott area?